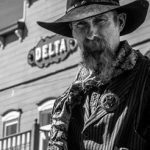 In 1877, Clay Calhoun was Deputy U. S. Marshal for Arizona (and Tombstone) and leader of a group of five or six men known as "Outlaw Exterminators, Inc." By the time the Earps arrived in Tombstone in 1879, Calhoun had moved on. Our quality replica has a rustic finish and a spring pin backing. Approx. 1 3/4" high. Disappointed about the size. For the cost. I was relying on your store for the authenticity of the badge, but my research on internet tells me otherwise. 1. Authentic badge for the badge has 2 1/8 inches, yours are less than 2 inches 2. Authentic badge has AT (Arizona territory), your’s says AZ. Therefore I had to purchase the authentic replica from Ebay.